I can't believe it's already September? Really? Anyhoo - with all my obsessive behavior over all things pumpkin and fall, I still think it's slightly too early to bring it all out. Oh yes, I'm pinning all those wonderful pumpkin recipes I see on Pinterest and I've got my pumpkin candles in my hall closet ready to be lit. But I can't bring myself to bring them out yet. I mean, it's still 88 degrees outside. Yuck. I'm still enjoying finishing up all the great summer fruits and goodies. A couple of weeks ago, my family and I were out and about and found a great deal on some local blueberries. While I'm not a huge blueberry fan, I couldn't pass them up. They were so juicy and flavorful, better than any blueberry I've ever had. We bought a lot, since I knew I wanted to bake with them. 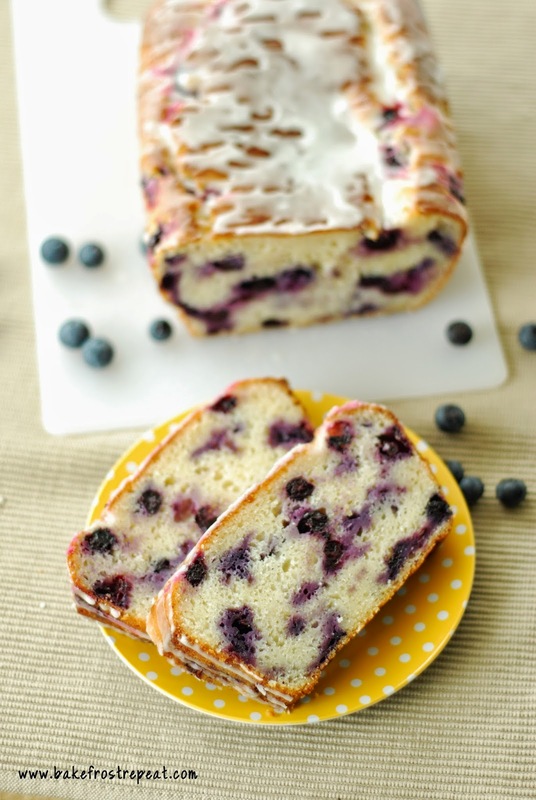 One of the things I made was this Glazed Lemon Blueberry Loaf. I cannot stress enough how well lemon and blueberry go together. It's like magic. This loaf (c'mon, it's cake) was super moist and the perfect blend of tart and sweet, especially with the lemon glaze. 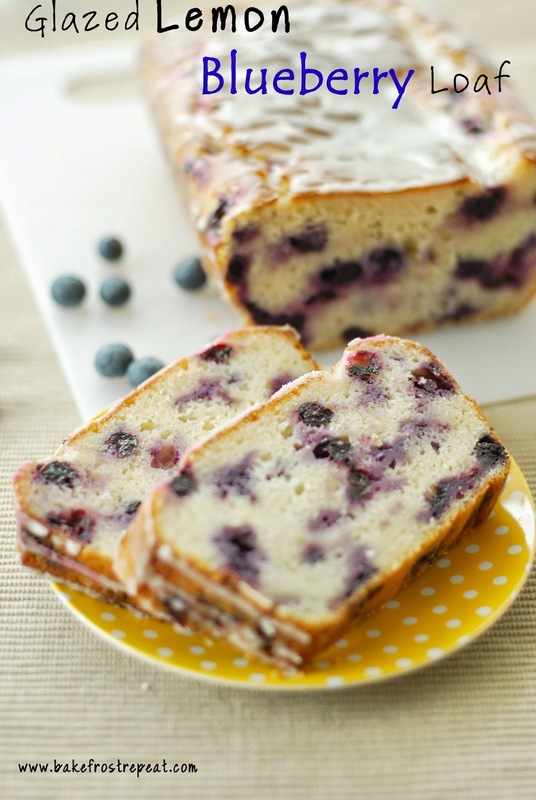 So if you have blueberries to use up, make this. And then join me in pumpkin overload preparation, 'cause you know it's coming. Preheat the oven to 350 degrees. Grease a 9x5 loaf pan. Set aside. In a large mixing bowl, combine the sour cream, sugar, eggs, lemon zest, lemon juice, vanilla extract, oil, and stir until combined. Set aside. In another large mixing bowl, whisk together the remaining flour (1 1/2 cups), baking powder, and salt. Then, slowly add the dry ingredients into the wet ingredients and stir until smooth. Next, carefully stir in the blueberries until they are just mixed into the batter. Bake for 50-55 minutes or until a cake tester, or toothpick, inserted into the center of the loaf comes out clean. (I baked right at 50 minutes). Let the loaf cool in the loaf pan for about 15-20 minutes, then place on wire rack to cool further. While it is cooling, you can make the glaze. I stored this loaf wrapped in plastic wrap on my counter for a few days, but you might want to store in an air tight container as the blueberries kind of leaked a little and left some stickiness on my counters. I haven't tried freezing this loaf, but I don't see why it wouldn't freeze well, just wrap tight in tin foil and place in a freezer bag. Ooo, I love dessert breads like this! I'm so trying to hold on to summer as long as I can, but damn that pumpkin is everywhere! I was in Williams-Sonoma and sampled their pumpkin bread...oh my it was good! Yes, I like to hold on to summer as long as I can, too. This loaf looks delicious! This bread would make the perfect breakfast! :) I'll have 3 slices, please! !